Oregon Scientific SE233 (Vibra Trainer Elite Pro) heart rate monitor is an intermediate heart rate monitor for women with smaller wrists. 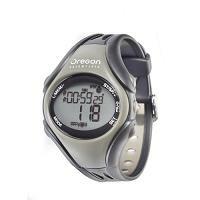 It is essentially the same watch as the Oregon SE212 (Vibra Trainer Elite) with the following additions: Lap marking, 3 exercise profiles and an enhanced Smart Training Program. It shares with the SE212 these two distinctive features: Vibration alert and switchable analogue and digital transmission and thus will be particularly appreciated in a crowded, noisy gym environment or among runners running in a group. Note: Apart from the size and shape of the watch, the Oregon Scientific SE233 has the same features as the Oregon Scientific SE232. You can also get the watch to set your heart rate training zone automatically for you, based on your gender, age, height, weight, activity level (how often and heavily do your exercise) and target activity (how intense do you want your training to be). You get your Body Mass Index computed after you have entered your personal data. An audio alarm (if switched on), wrist watch vibration (if switched on) and visual indicators alert you when you are training above or below your heart rate zone limits. Timer and stop watch. You can do two types of training: Timer-based Smart Training Program and the usual stop watch based training. You can now mark laps using the stop watch. You can take up to 99 laps in total. You can set up 3 exercise profiles. Each exercise profile sets up what intensity you want to train at. Effectively it defines your heart rate training zone. You then choose one of the profiles for use with either the Smart Training Program or the stop watch. The Smart Training Program consists of a warm up period, an exercise period and a recovery period with your heart rate limits being set automatically for you. See bullet point above. The end of each period is marked by the firing of a timer. The periods are adjustable in length, except the recovery period (fixed at 3 minutes). While the Smart Training Program is running, you can review the following data (in addition to the current heart rate): Remaining warm up or exercise or recovery time (depending on what stage of the program you are in), calories burnt and % of fat burnt, and current time. While the stop watch is running, you can review the following data (in addition to the current heart rate): Current stop watch time/split time, lap time, calories burnt and % of fat burnt, and current time. If you have taken laps during your stop watch based training, you can review for each lap: Lap time, lap number, maximum heart rate, split time, average heart rate, calories burnt, % of fat burnt, time in/above/below target zone. All of the information is related only to the particular lap you are looking at. It is very detailed. Basic time keeping: Time, date and two alarms. With each alarm, you can set it to go off every day, only on weekdays, or only on weekends. Wireless heart rate monitor (ECG accurate) with a switchable analogue and digital chest strap transmitter and a wrist watch receiver. One touch on a button located on the transmitter changes the transmission type. Keypad tone: If switched on, you get a beep pushing a button. If switched off, you get silent operation. Battery for chest strap transmitter is user-replaceable. The features in bold above denote the features found in SE233 but not in SE212. To save space, please refer to the SE212 page for a short explanation of the common features shared between the SE233 and SE212. If you are a runner, you can now record laps on the Oregon Scientific SE233 while you are running, giving you comprehensive information about each section of your run. For example, if you are going for your usual 5 mile run, you can take a lap every mile. When you are done, you can review a host of statistics to see if the training goes okay. If you decide to do Smart Training instead, the Oregon Scientific SE233 adds a new recovery phase to the end of the exercise period. At the end of the recovery period, you get your recovery heart rate measured. It can give you some indication whether you have been training too hard or whether you are getting fitter. The Oregon Scientific SE233 shares with the SE212 switchable analogue and digital transmitter and vibration alert. In addition, the Oregon Scientific SE233 includes lap recording facility useful for runners. Note: Oregon Scientific has also released the SE232 (Vibra Trainer Fit Pro) model, which has the exact same features as the SE233, but designed for users with average or larger wrists. The next model in the SE series is the Oregon Scientific SE300 heart rate monitor.